When I got a call mid week asking to come talk on the radio, i didn’t take it too seriously. My first thought was it was one of my friends playing a prank on me, yeah i do have some crazy friends..lolllzz So i didn’t take it seriously, till i was called up again and given the agenda. Yes i was actually asked to come on the radio and talk about my blog. Yay.. Truly a happy moment. The meeting was scheduled on Saturday i.e 20th of February and we had to discuss how are we going to go about it. When I reached the 94.3 Radio one office to my surprise I was asked to do the recording right away. I was completely stumped as I hadn’t prepared any thing at all. 😦 On top of that I was most worried that I will sound very shrieky. 😉 However, my doubts were put to rest when I met the host of the show – Tedha Medha Shubham. He is such an energetic and funny guy that I knew then this is going to be fun. 🙂 He made me feel very comfortable and was very professional in his approach. 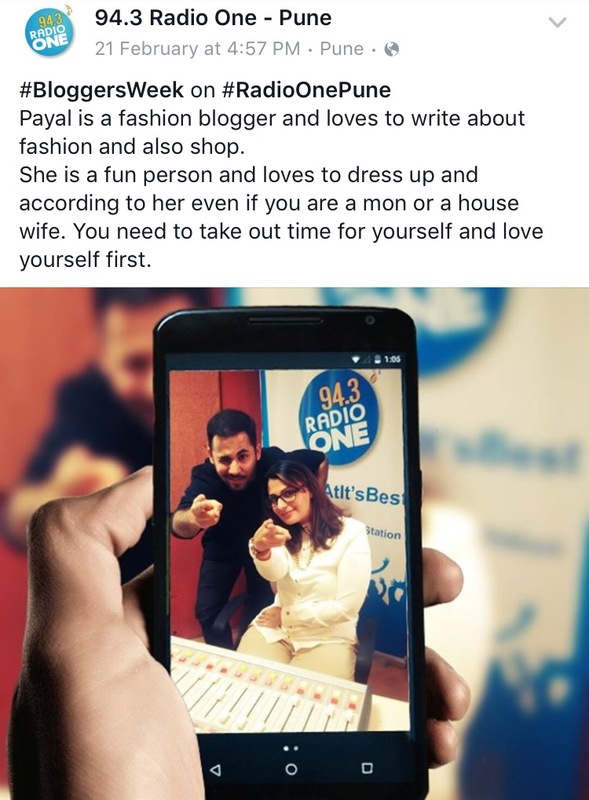 At Payal Scribbles I truly believe that its very important to spend quality time with oneself, do something special each day and live a content life. We are very special and should never forget our own identity. Super awesome! You rocked and Aedan was the best surprise!! Super proud of our very own fashionista… many more cheers coming!